The arbor vitae need help. I probably ought to figure out a way to water them a bit more regularly, and maybe I need to get the grass around them cleared away. I don't know. But they sure aren't growing much. In this image is the plum stick and its happy little surrounding of real grass, which needs to be cut real soon. 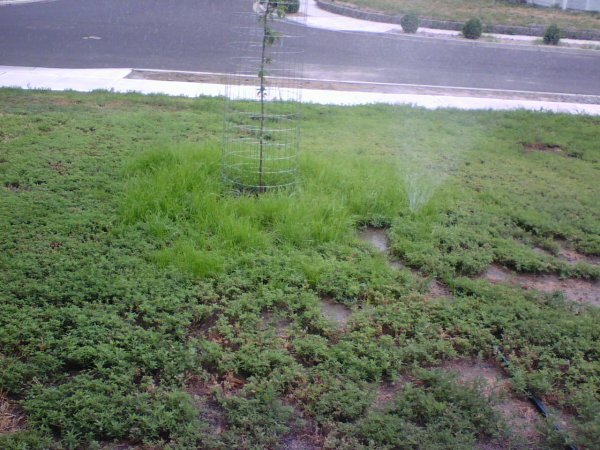 The rest of the vegetation is weeds, particularly tumbleweed. This is just after I turned on the sprinkler, so it looks even more damp than usual. The grass is not only more vibrant, it's also twice the height of the tumbleweed. I will cut it all down to the same height next time I mow, and by the next day the grass will be towering over the tumbleweed again. I'm trying to get the grass to seed in those bare patches, but the birds are very fond of grass seed and consider me a source of food. Moving on, the tomatoes are exploding outward and even need some help. 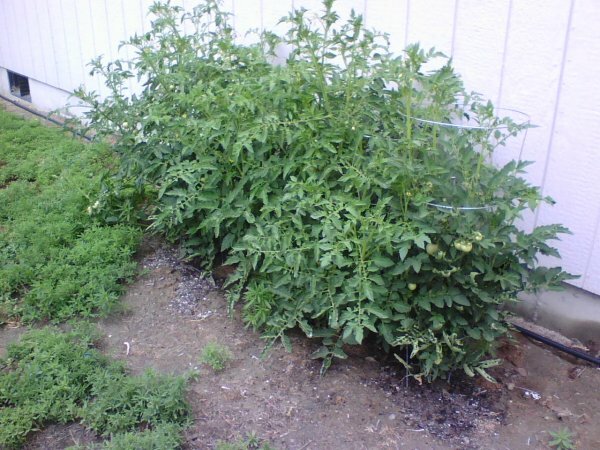 On the far left of this picture, the biggest plant has gotten so heavy with tomatoes that one of the branches is now sagging to the ground. I believe I will need to stake that up to keep it happy. And, in the future, I think I will plant the tomatoes with MUCH more space between them. These five are crowding each other badly. But then, this experiment was not expected to succeed, so I'm still shaking my head over the growth these guys have managed. And this last picture is the same largest cluster of tomatoes on the far left plant. Somewhere in that cluster is the oldest and biggest one, the one I took a picture of when it first blossomed, then as it grew. 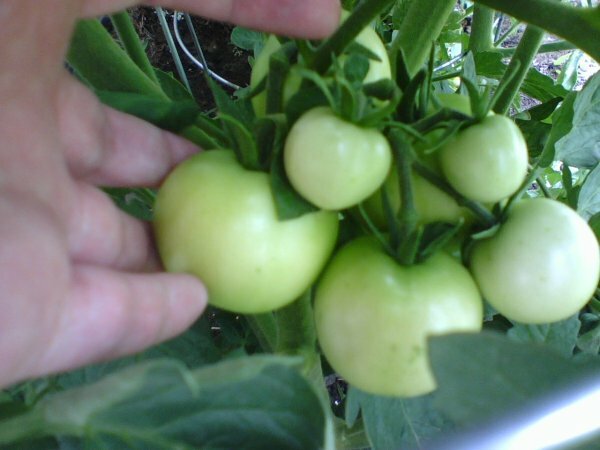 Hopefully, one of those tomatoes in this cluster will be the first to be harvested and eaten. We'll have to wait and see.